Fresh ingredients like lemon, asparagus and romaine lettuce can be enjoyed year-round. This recipe is especially nice during the late Spring days when you can be outside grilling a super easy and healthy meal like the Lemon-Garlic Pasta with Grilled Veggies Recipe featured in today’s post. This Lemon-Garlic Pasta with Grilled Veggies Recipe is super easy to create. 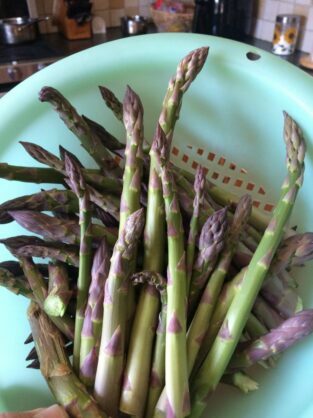 Enjoy favorites from your home garden in this dish like lemon grass, asparagus and lettuce. Bring a large pot of salted water to the boil. Cook the ziti according to package directions. Drain and reserve. Heat an outdoor grill or grill pan over high heat. Season the chicken with salt and pepper and a little of the oil. Place the chicken on the grill and cook for 3 – 4 minutes per side or until cooked through. Reserve. Brush the romaine and the asparagus with the remaining oil and season with salt and pepper. Place the romaine and asparagus on the grill. The romaine will start to char on the outside, turn to allow all sides to get a little char, about 3 minutes total. Remove from the grill and reserve. The asparagus will turn bright green and have grill marks when it’s ready, also about 3 minutes. Remove from grill and reserve. When the chicken, romaine and asparagus are cool enough to handle, chop the chicken into bite-sized chunks, roughly chop the romaine, and slice the asparagus into 2” pieces. Reserve. In a large bowl, whisk together the lemon zest, lemon juice, olive oil and garlic. Place the chicken, romaine, asparagus and ziti in a bowl and toss to combine. Taste and adjust seasoning if needed. 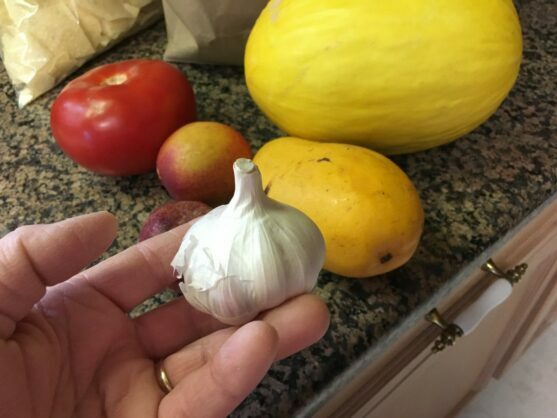 Featured below is a collection of images of some of the fresh veggie I recommend growing in your home garden. Nothing beats the feeling of growing your own food and bringing it to the ‘grill’. Plant garlic bulbs about 8 weeks before first hard frost in Autumn. 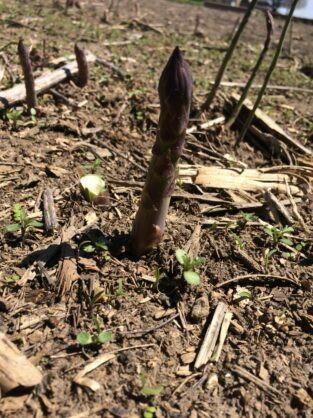 Fresh harvest of Asparagus in Spring.